So I get settled down tonight to read what everyone has been up to all day and notice a running thread with some of my favorites. Is everyone feeling a little less than fresh today? Finally we zoom in for the close up with This Old Crack House. Well, we may not all be the worlds next super model and our hard work might not be showing up on our physique, but I'm thinking some of our houses are looking pretty damn good. "Very nice. 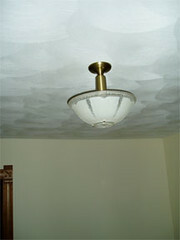 I good light fixture really makes a room. The one room I've actually finished is the bathroom. 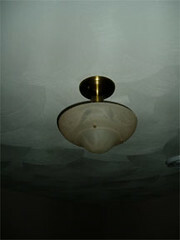 I put in this really nice brass fixture that I got off ebay. I had to clean it up are re-wire it, but it really makes the room. After I got it up I just stood there an admired it for a while." I know I too have spent an abnormal amount of time just staring at my new lighting fixtures over the last two years. Probably more time than I've spent looking at nice looking men (Tim will be happy to read that!). But I was so feeling what you said Grex. If old house parts were like body parts we'd be "light" people, right? So perk up everyone. 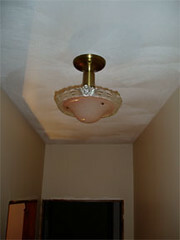 We don't care about your "headlights" :) We want to see more bedroom lights! Light in the big bedroom next to ours. 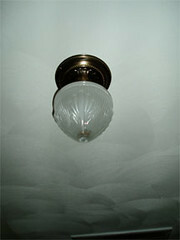 Light in the guest bedroom. Light in the up-stairs back hall. Light from the up-stairs front hall (there are three total). Don't hate me because my house is beautiful!